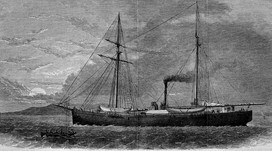 Captain Hall's Arctic Expedition, the "Polaris"
Type and Characteristics - Heavy screw schooner-rigged tugboat built at Philadelphia, PA, as America for John W. Lynn; purchased by the Navy and commissioned as gunboat USS Periwinkle January 1865, Acting Master Henry C. Macy in command. Displacement 383; length 140'; beam 28'; depth 12'; draft 10'6"; complement 16; Armament 2 24-pounder guns. January 1865 – Commissioned as gunboat USS Periwinkle, Acting Master Henry C. Macy in command, she operated primarily in the Rappahannock River with the Potomac Flotilla. They intervened between a fleet of oyster schooners and a threatening Confederate enemy force, and interrupted contraband business between lower Maryland and Virginia. They also cleared the rivers of mines and fought guerillas ashore. June 1865 – She was assigned to Norfolk Navy Yard. 1867 – Periwinkle was placed in reserve. December 1870 – Selected for service with the Hall Scientific Expedition to the Arctic, and sent to the Washington Navy Yard for repairs. 9 June 1871 – Renamed Polaris, she arrived at Brooklyn Navy Yard to complete loading of stores and provisions for the expedition. 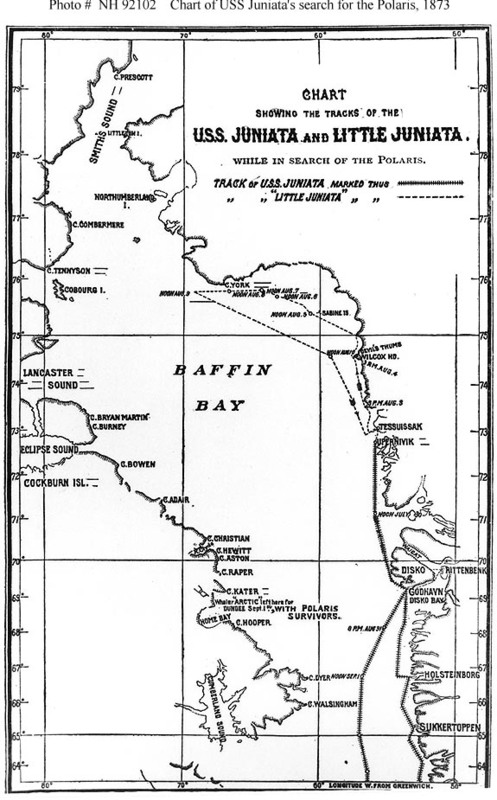 29 June 1871 – Sailed for the North Pole, Charles F. Hall in command and 32 crew and scientists aboard. The expedition ran into personnel troubles early, with dissension among the officers and scientific staff. Hall's command over the scientific staff was openly rejected. 10 August 1871 – USS Congress arrived at Godhavn, Disko Island Greenland, with extra supplies. Hall asked Captain Davenport of the Congress to intervene with his crew. 18 August 1871 – She reached Upernavik, Greenland, where they picked up the Inuit hunter and interpreter Hans Hendrik. 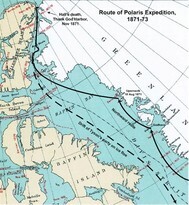 The Polaris proceeded north through Smith Sound and Nares Strait as far as 82°29&apos;N., passing previous furthest north records (by ship) held by Elisha Kane and Isaac Hayes. 10 September 1871 – Arrived at Thank God Harbor (now called Hall Bay) and settled in for the winter. Hall made preparations for a sledging trip with the aim of beating Sir William Parry's furthest north record. 10 October 1871 – Hall took two sledges with first mate Chester, and the native guides Ebierbing and Hendrik and went north. Upon their return on 24 October 1871, Hall suddenly fell ill after drinking a cup of coffee. Hall accused several of the ship's company of having poisoned him. 8 November 1871 – Hall died, and was taken ashore and given a formal burial. Command of the expedition was turned over to Sidney O. Budington. 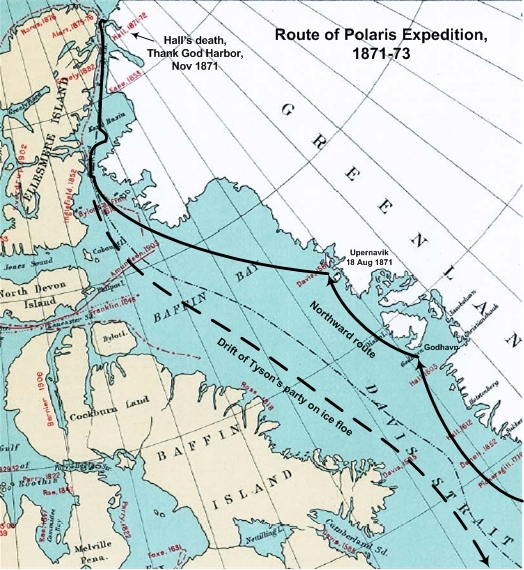 6 June 1872 – An expedition to try for the Pole was dispatched, led by Chester in a whaleboat; a total of three of the Polaris' lifeboats were crushed by the ice within a few miles of Polaris in this attempt. The expedition had failed in its main objective to reach the North Pole. July 1872 – The Polaris turned south for home. 12 October 1872 – An iceberg threatening the ship, and Budington ordered cargo to be thrown onto the ice to buoy the ship. 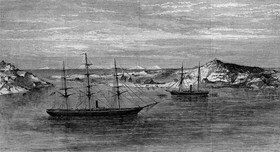 Nineteen members of the expedition, including all of the Inuit, were out on the surrounding ice during the night when a break-up of the pack occurred. They found themselves stranded on an ice floe. Attempts to attract the ship's attention failed. The group drifted on the ice floe for the next six months over 1,800 miles. 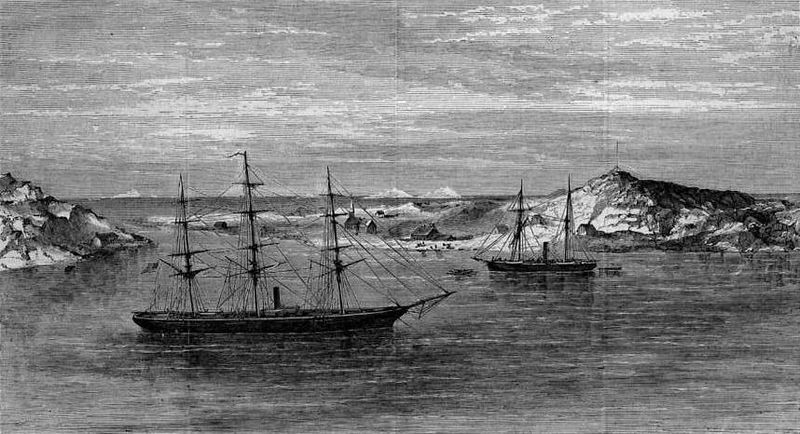 16 October 1872 – With the ship's coal stores running low, Captain Budington decided to run the Polaris aground near Etah, Greenland. They built a hut from lumber salvaged from the ship and the Etah Inuit helped the men survive the winter. 24 October 1872 – They extinguished the ship's boilers to conserve coal. The bilge pumps stopped for good, and the ship heeled over on her side, half out of water. After wintering ashore, the crew built two boats from salvaged wood from the ship. Fate – Run aground and wrecked on 24 October 1872, her timbers were salvaged to build boats to get her crew home the next spring.